Are you tired of being overweight? 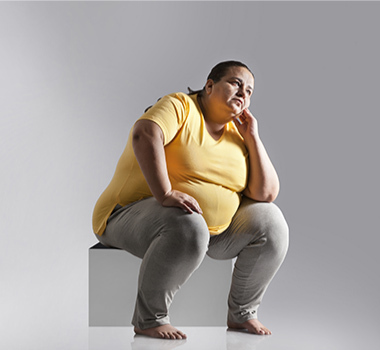 Obesity has become one of the most challenging diseases that people struggle to be cured from. Diet and exercise are the first treatment options; however, they fail to provide measurable outcomes among moderately and severely obese people. Numerous studies exposed that bariatric surgery & weight-loss surgery, is the appropriate procedure to help those people lose weight and improve their health score. Bariatric (weight loss) surgery is a life-changing technique by which individuals can enjoy a higher quality of life. Weight loss is achieved by reducing the size of the stomach pouch so you will feel full after smaller meals and will not want to eat too many calories for your body to handle. You can choose gastric banding, sleeving or bypass and our surgeons will recommend the best solution for your unique requirements. 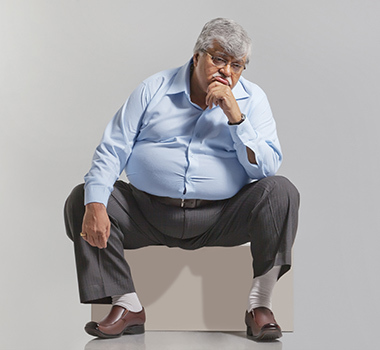 Obesity has become one of the most challenging diseases that people struggle to be cured from. If you have experienced some of the issues associated with trying to lose weight and failing then surgery may be the solution for you. In addition to weight loss, it may lower high blood pressure and high cholesterol. Gradually, it can reduce breathing problems, stops the progression of obesity, and reduce risks of developing new serious conditions. Diet and exercise are the first treatment options for obesity; however, if they fail to provide favourable outcomes among moderately and severely obese people then bariatric surgery & weight-loss surgery can be the appropriate procedure to help those people lose weight and improve their health score. Why take your weight loss journey with us? When you are looking for bariatric surgery it is recommended that you use a hospital with a high turnover of related surgeries and Zulekha have achieved this with many successful surgeries over many years. Zulekha Hospitals surgeons are internationally recognized in weight loss surgeries and know how to give their clients the best treatment and advice during and post surgery. You will benefit from healthcare of the highest quality and feel safe with Zulekha Hospital taking care of you. This is the most common and successful combined procedure for weight loss surgery. In this procedure, the surgeon creates a small stomach pouch to restrict food intake. Then a Y-shaped section of the small intestine is attached to the pouch to allow food to bypass the lower stomach, the duodenum (the first segment of the small intestine), and the first portion of the jejunum (the second segment of the small intestine). This reduces the amount of calories and nutrients the body absorbs. 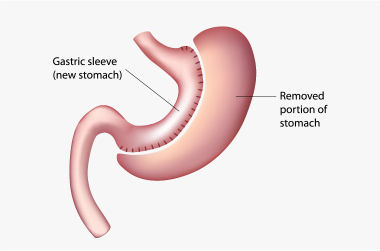 The gastric sleeve procedure involves reducing the size of your stomach. During the operation up to ¾ of the stomach is removed by dividing it, with the new stomach taking the shape of a narrow tube or sleeve. This effectively restricts the stomach capacity without affecting its function, so that the amount of food that can be eaten at one time is restricted. A band is placed around the upper part of stomach to create a small pouch to hold food. The band limits the amount of food that the person eats by giving a feeling of fullness after eating small portions of food. Revision weight loss surgery is a surgical procedure that is performed on patients who have already undergone a form of bariatric surgery, and have either had complications from such surgery or have not successfully achieved significant weight loss results from the initial surgery.Procedures are usually performed laparoscopically, though open surgery may be required if prior bariatric surgery has resulted in extensive scarring. 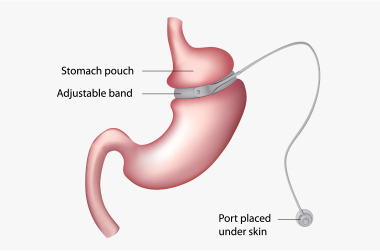 An adjustable gastric band is an inflatable silicone prosthetic device that is placed around the top portion of the stomach. This procedure can be performed as a revision procedure for many patients who have had a previous stomach stapling, gastroplasty procedure, or Roux-en-Y gastric bypass surgery but have regained weight. The procedure is normally performed laparoscopically, though in a small minority of instances prior surgery may have resulted in extensive scarring,requiring open surgery. 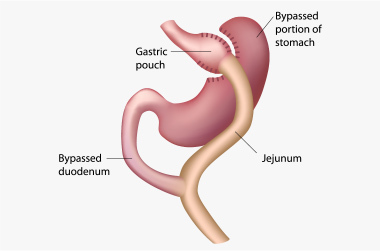 Roux-en-Y gastric bypass is a commonly chosen revision technique,particularly in patients who have not been successful in meeting their weight loss goals after stomach stapling, gastroplasty, vertical gastric banding, or laparoscopic-adjustable gastric banding. Often the prior procedure still lends itself to a revision to become a Roux-en-Y gastric bypass. It may be performed laparoscopically, and the average recovery time is approximately two weeks.The weight loss success rate after Roux-en-Y gastric bypass revision surgery is generally excellent. There are some associated risks of vitamin deficiency and stomach ulcerformation requiring prevention with multivitamins and proton pump inhibitors. Sleeve gastrectomy removes a large portion of the stomach, with the remaining portion reshaped to become tube-like or sleeve-shaped. This creates an increased sense of satiety and decreased hunger in patients, often leading to weight loss and improved health.The procedure is generally less invasive than many other weight loss surgeries and has a lower potential for complications than may be associated with gastric bypass surgery. Mini-gastric bypass can be performed on patients who have undergone either gastric band or sleeve gastrectomy in the past and have not lost significant weight or regained weight after initial weight loss. This procedure again can be performed laparoscopically. Weight loss is achieved by adding malabsorptive component to the already existing restrictive procedure. Dr. Aws has more than 18 years of experience in the field of General Surgery and has worked in The Medical City, Bagdad a reputable Teaching Hospital in Iraq. He has also worked in many private institutions such as the Dijlah Private Hospital. Dr. Aws graduated from the prestigious University of Bagdad – College of Medicine. Sin ce then he has been a part of the Arab Board of General Surgery. He served as a specialist in General Surgery at Bagdad Teaching Hospital since 2005; with a vast experience in conventional and laparoscopic procedures. In 2010 he began performing the sleeve Gastrectomy procedure for morbidly obese patients with significant results. To date he has operated on more than 100 patients. In 2014 he was assigned as a Supervisor in the Arab Board Training Program for General Surgery, also assigned as a Supervisor & Head of the Department of Laparoscopic at Bagdad Teaching Hospital Medical City. 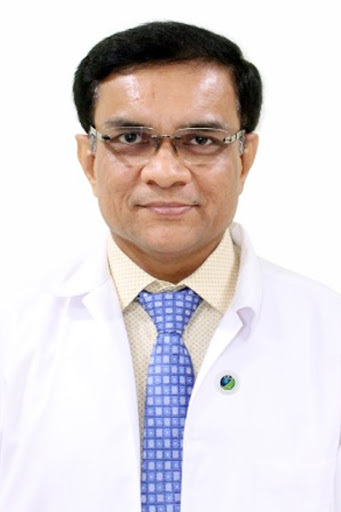 Dr. James Zachariah graduated in medicine in 1984 and has 24 years of surgical experience following his surgical residency in 1992 from Christian Medical Colleges, Vellore and Ludhiana. Dr. Zachariah, received the award of OUTSTANDING INTERNATIONAL BARIATRIC FELLOW 2015, at Taiwan, for his excellent work and contribution in the field. He was trained in Bariatric Surgery in Asia Pacific Bariatric and Metabolic Surgery Center, MIN-SHENG HOSPITAL, TAIWAN under Dr. Wei-Jei Lee, a world renowned Bariatric and Metabolic surgeon. He has more than 15 years of experience in Laparoscopic surgery and has done over 160 bariatric procedures successfully so far. Dr. Zachariah has done considerable research in bariatric and metabolic surgery and has published several papers in the international journals as a first author and co-author and has also presented several papers in the international bariatric surgery conferences. Prior to joining Zulekha Hospital, Dr. Zachariah was the Head of Dept, of General and Laparoscopic Surgery in Care Hospital, Vizag, India. 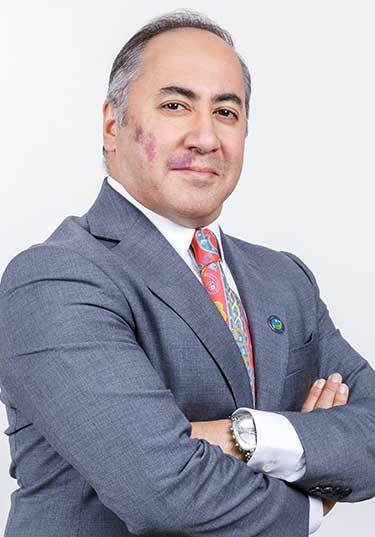 Dr. Ayman is a highly experienced bariatric (Obesity) and general surgeon, and a professor of laparoscopic (keyhole) and general surgery. He is a Fellow of the American College of Surgeons, and a Certified Surgeon of Excellence ( European Chapter, International Federation for the surgery of Obesity and Metabolic Disorders). 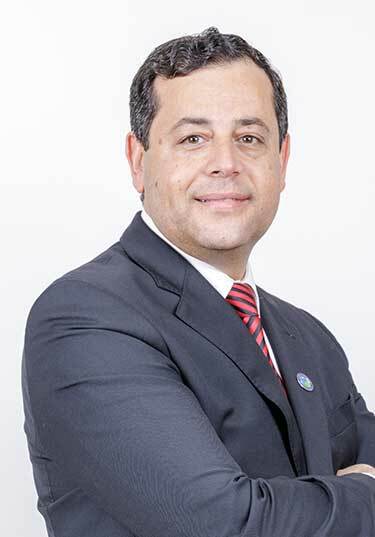 Dr. Ayman earned his medical degree as well as his Master (2000) and Doctorate (2004) in General Surgery from Ain Shams University in Cairo, Egypt. He undertook further study at Louis Pasteur University in Strasbourg, France, where he was awarded a Diploma in Laparoscopic surgery (IRCADS-2007). He also joined Cleveland Clinic Florida - USA as Clinical research fellow(2010). He has been practicing in the UAE since 2014, having previously worked in the USA, Austria, Saudi Arabia and Egypt. Dr. Tagore has more than 20 years of experience in the field of General Surgery out of which 17 years into Laparoscopic Surgeries and 10 years of Bariatric Surgery experience. After his graduation and postgraduation in General Surgery from prestigious Andhra Medical College, Visakhapatnam, India, he went to UK for higher surgical training and obtained FRCS from the Royal College of Physicians and Surgeons of Glasgow, Glasgow, UK. He worked for more than 8 years in reputed hospitals in UK and obtained training in Gastrointestinal and Laparoscopic Surgery. He was also awarded a Diploma in Laparoscopic Surgery by University of Strasbourg, Strasbourg, France. He did Fellowship in Bariatric Surgery from Legacy Health System Portland, USA and Fellowship in Advanced Laparoscopic Surgery from University of Kentucky, Lexington, USA. He is trained in Laparoscopic and Robotic Colorectal Surgery from Korea University Anam Hospital. During his training in the USA, he has performed more than 400 Bariatric surgeries and equal number of Laparoscopic Surgeries. He has performed thousands of Laparoscopic Surgeries including advanced laparoscopic procedures related to stomach, intestines, colon, spleen and different types of hernias. He has worked as Senior specialist General Surgery, Laparoscopic and Bariatric Surgery at Rashid Hospita,Dubai for the last 4 years . He has also worked as Consultant General Surgery Laparoscopic and Bariatric Surgery with Damascus Hospital, Syria from 2009 – 2013. He has worked as Specialist General Surgery and Laparoscopic and Bariatric withAl Adan Hospital Kuwait from 2000 – 2009. Over all his experience he was working in big teaching centers ,and was involved in regulating and teaching in the residency program of general surgery in these centers. He is the head of scientific committee of Emirate society of laparoscopic and endoscopic surgeons. Dr. Nafad has obtained Master and Medical Doctorate in General and Vascular Surgery from Cairo University, Egypt. Special training in Redo Bariatric surgery. Fellow in Enodovascular surgery Emory hospital - Atlanta, Georgia. Member of the Arab Gulf Society for Gastroenterology and Catheterology for the treatment of veins and arteries. Member of the International Society of Orthopedic Surgery (IFSO). Member of the American Society of Surgeons. How long will I be out from work after metabolic or bariatric surgery? After surgery, many patients return to work in 4-6 weeks. You will have low energy for a while after surgery and may need to have some half days, or work every other day for your first week back. Your surgeon will give you clear instructions. Most jobs want you back in the workplace as soon as possible, even if you can’t perform ALL duties right away. Your safety and the safety of others are extremely important – low energy can be dangerous in some jobs. Many patients are worried about getting hernias at incisions. Incisional hernias are almost never a problem from work or lifting they are more often the result of infection. Right away! You will take gentle, short walks even while you are in the hospital. The key is to start slow. Listen to your body and your surgeon. If you lift weights or do sports, stay “low impact” until you are given the all-clear (avoid competition, think participation). Build slowly over several weeks. If you swim, your wounds need to be healed over before you get back in the water. Can I have surgery if I have heart disease? The short answer is yes. One complication of obesity is the increased rate of heart disease; therefore surgery may be the move that allows you to continue a healthy life and manage your heart disease. However, you should choose a hospital that deals with a lot of gastric surgery as they will be experienced and also select a hospital that has heart specialists who can advise the bariatric surgeons on any relevant aspects. Zulekha achieve all these aims so if you have any concerns, please speak to our team, we are happy to discuss all aspects in detail. Hair follicles are a complex part of humans’ anatomy, they are susceptible to so many aspects of our physiology that it is hard to give a definitive answer to this question. Some patients have noticed hair loss after surgery, while many haven’t. We try to reduce the likelihood of hair loss in our patients with a well-planned post-op diet and the correct amount of vitamins and minerals. We have found that although we cannot prevent hair loss in every single surgery, when it does occur, we can reduce the amount of loss and the duration. In order to get the best results from your bariatric surgery and to increase the likelihood of a safe operation you will need to go on a 1-2 week liquid diet. The purpose of this is to reduce the amount of fat stored in your liver and allows the surgeon to operate in a clear, safe area with reduced risk. This will also enhance post-operative healing. Exercise and physical activity in general is recommended after bariatric surgery. Just daily short walks at first will help you recover in a healthy manner, reduce any risks from the surgery and help you return to a normal life as quickly as possible. After 4-12 weeks (depending on the type of surgery) you can start cycling, walking, progressing to swimming once your wound has healed and then on to weights or more vigorous activity as you recover and start losing the weight. 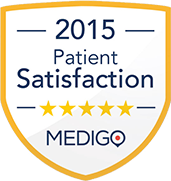 We have found that our patients are eager to get going as they start to enjoy more energy than ever before. I am unable to walk, can I still have surgery? You will need to speak to your surgeon. We have successfully operated on none mobile people and allowed them to return to a full and active life as a result of bariatric surgery. Please speak to your consultant about any issues you may have. Can I stop taking my medication after surgery? Bariatric surgery changes many aspects of one’s life, and medications are no exception. Most patients will be prescribed certain medications and supplements after their surgery, but the surgery can also affect what medications are safe to take for other reasons and how you take them. Your consultant will be able to advise on changes in volume to medication or even reductions in the amount of medicines required.